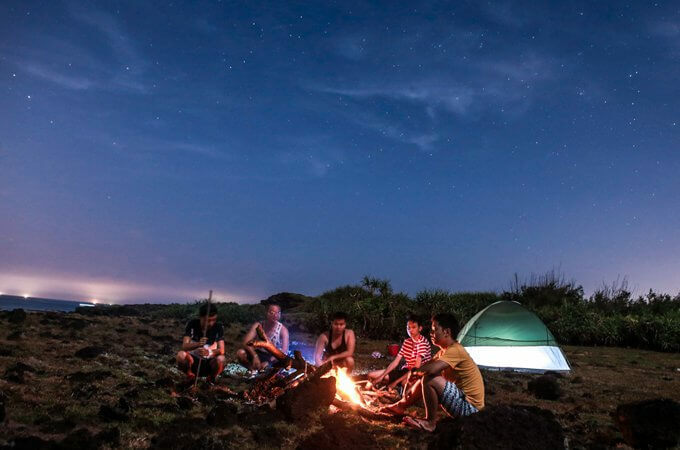 From 17:00 onward is the ideal time to start camping at West beach, which is considered to be a great place to watch the sunset and sunrise. The small Ly Son Island (also known as An Binh Island) belongs to Ly Son Archipelago, about 3 km away from the main island, is one of the destinations not to be missed when visiting Ly Son. The island was volcanic millions of years ago, with about 100 households on the island. Most visitors to Ly Son will visit the island during the day, not many people stay here because the service has not developed. But if you have a lot of time, spend at least a night here camping. The feeling of camping on the sunset, watching the stars shimmering in the sea and the beauty of the sun at dawn is always one of the best experience. From the Big island, you buy tickets to the small island at the harbor, fare is 40,000 VND (1.5 USD) person for one way. The boat runs from 7.30 am to 4.30 pm. From the small island port, you can go through the island to West Beach, the most beautiful beach here. As soon as arriving at the port, you can see many electric cars of the bars on the West waiting. You can rent an electric car to go around the island, for VND 30,000 / person for two ways. Small Island does not have natural fresh water and no electricity grid so everything will be more expensive. To be prepared for camping, you should buy seafood in the port early in the morning, when the fishermen coming back from the sea, it would be cheaper and much more fresh. If not, then you can buy on the Small island. The West beach area has a range of food outlets. You can order food here. Fresh water is filtered from the sea so the water here is quite expensive, about 20,000 VND / bucket. West beach is always the beach that tourists to the island love the most. The white sandy beach is visible to the bottom and next to it is coral reefs, visitors can dive to watch the coral reefs here by boat, at a price of 60,000 VND per person for 2 hours. Each basket can carry about 6 people (including boaters). Diving place is 300 meters from the beach. You can use the coral reef diving service in the morning when you arrive. Boat baskets will take you floating on the sea, passing through the clear sea water, looking through the bottom. The boatman will give each person a diving glass and a life jacket. For those who do not know how to swim, do not be afraid, because you just have to bow to the sea surface looking down to the bottom of the diving glass, you can see the coral. After seeing the coral, go back to the restaurant for lunch and rest. About 15-16h is the time for taking photos on the island. Then you can swim in the West beach, where the beach is quite shallow and blue. You can swim and watch the fish, or jellyfish here. 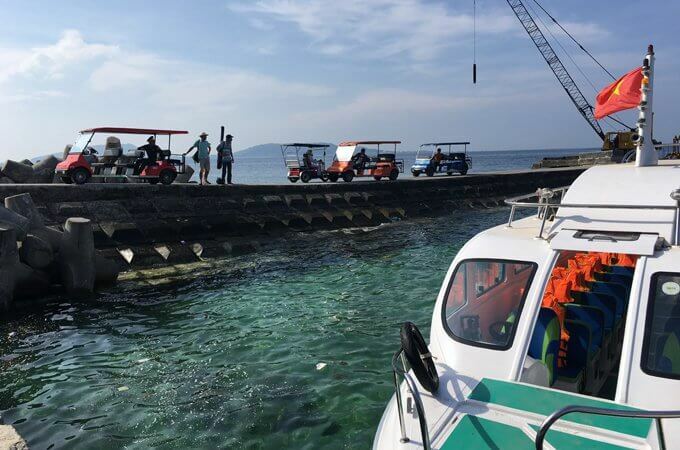 This is the suitable time to swim because most visitors return to the main island, only some groups stay on the island, so you can freely take pictures and swim without anybody. For those who love to take pictures of exposure, the night time here is an ideal setting. The whole starry sky is not covered by light, giving you shimmering pictures. Or you can get up early in the next morning to take photos, make coffee and sit down to welcome sunrise. 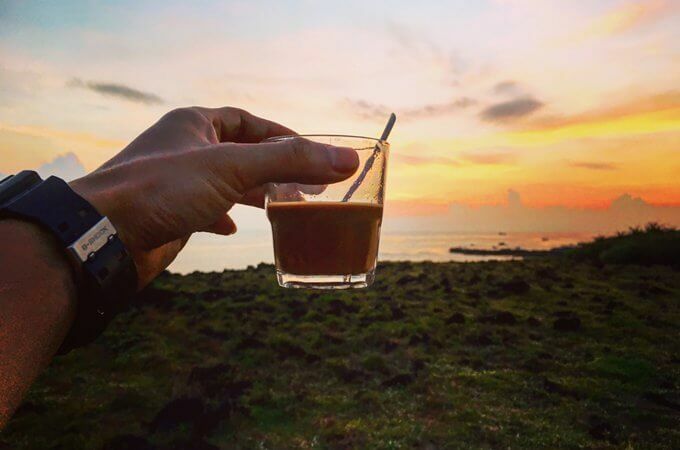 Drinking coffee and gazing at the sea at sunrise is an extremely enjoyable experience. The feeling of sitting on the lava rocks, in front of the eyes is the immense sea – it is really overwhelming, an unforgettable memory to anyone. Then, pick up the tent, clear the trash and return to the Big island.